but wanted to go to a jazz concert to put this strange colour - Jazzberry - into a context. The concert would not start till rather late at night. While waiting, I tp'ed around our beloved universe and found myself in a very nice harbour area. Peaceful and well made. Here my COCO dress and me, hanging around with nothing much to do in the Untroubled Sound. I sat on a bench, thinking of the latest developments on the stock exchange. Not likely, really , but who knows what goes through an avatar's mind? I I loved the place, with its rusty anchors and shipyards. But, well, I simply could not stay awake till 4 o'clock. So decided to immediately tp to the jazzclub. Before leaving, I noticed the SIM had a kind of dormitory for backpackers and other wandering souls. I arrived at a totally empty club. Of course: the concert was to start 3 hours later. I sat down and looked around. On the table in front of me, I saw a bottle of Jazzberry Wine (have to admit that Photoshop served it). 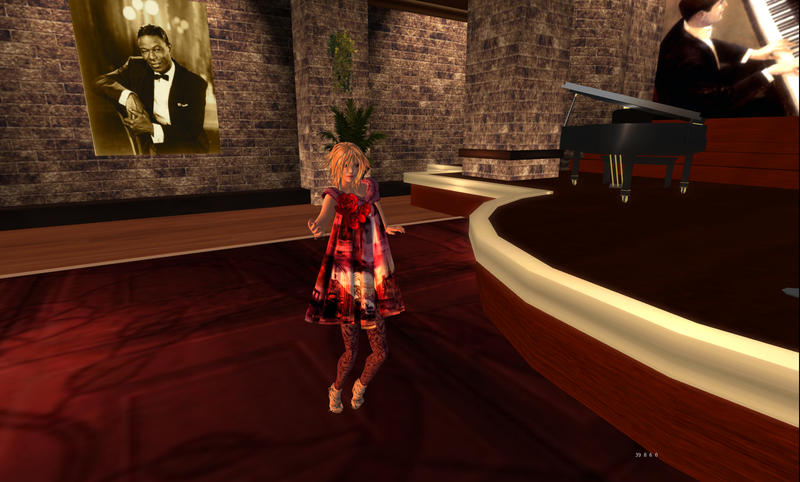 I asked my RL person to play some nice jazz music and enjoyed dancing all alone after midnight. I went back to the Untroubled Sound and had a good night's sleep - although the accomodations weren't that comfortable, to say the least. In the morning it was time for Luna's challenge. And what a pleasure to see all those fun, sweet and beautiful posts - inspired by the strange fruit colour. That dress is pretty much perfect for a jazz club, quirky yet sophisticated. Good choice! The dress is a real eyecatcher, its so vintage... Love the huge pattern with the even bigger flower... its awesome! 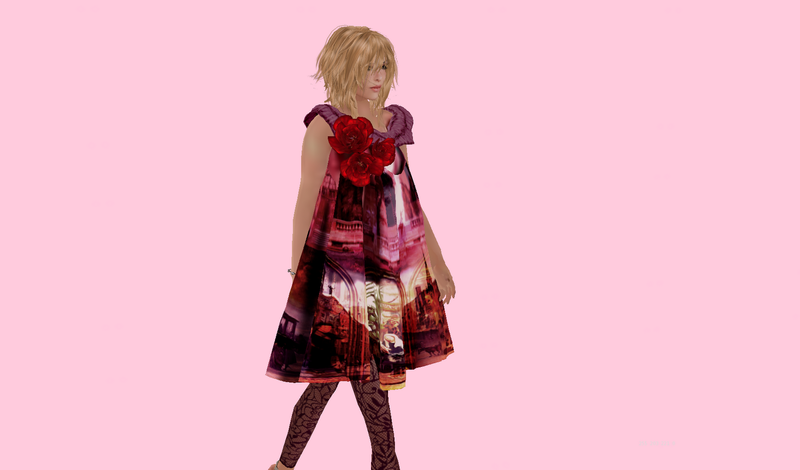 Great post, that is a beautiful sim and you look lovely. You look great, that dress is perfect for a jazz show! I have my life in Second Life - that marvellous world of fun and creativity.